I have some savings in a Stocks & Shares ISA. Let's suppose that something is going to happen in the next six months which will cause the value of the Pound to plummet. Will I see the value of the ISA fall too? Are stocks and share values fixed to the pound in that way? Or will their value remain unchanged while the Pound falls, resulting in an increase in the Pound value of the ISA? If the answer is "it depends", what does it depend on? A Stocks and Shares ISA is really just a wrapper around a shareholding account. The value of the account isn't really dependant on the fact that it's an ISA, its value is based on the shares you hold within it. Suppose, for example, you decide to hold an S&P 500 tracker in your account if the pound goes down relative to the dollar you could see the value of that go up because the underlying shares will be priced in dollars and they will be worth more pounds. Equally, if you hold a Nikkei tracker and the pound rises against the yen the value of your holding will fall in pounds even as it stays the same in yen value because your pound now buys more yen. The simple answer is it varies, sometimes they react together, sometimes not. 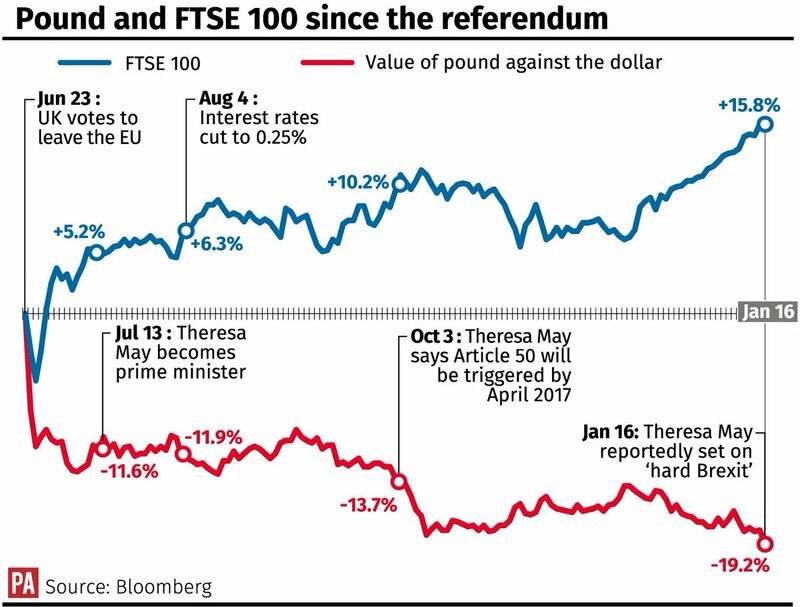 Here's a graph showing the performance of the FTSE 100 versus Sterling since the EU Referendum. The referendum result was a surprise, both Sterling and the FTSE fell quite sharply initially (stock markets hate uncertainty), with the FTSE then rebounding and performing generally well since. The Pound however hasn't recovered in the timeframe shown above and to this day is still some 10% down on where it was pre-referendum, as I type this. The main reason for this, is a lot of UK based companies make money overseas, so the pound doesn't influence their profits to a great degree. In fact a weak pound has helped exports so even UK based companies can make more profit as they are able to increase exports as their products are now relatively cheaper abroad. I expect once Brexit happens, if it does, the pound will fall further (more so the harder the Brexit) and based on what has happened since the refendum the FTSE could perform even better, but usual caveats apply, ie past performance isn't a guarantee of future results! Over a long period of time the US stock markets tend to outperform the UK so perhaps have a look at those. Not the answer you're looking for? Browse other questions tagged stocks united-kingdom shares isa or ask your own question. Where should I invest to hedge against the stock market going down? Raising Funds: What happens when you issue new shares by adding authorized capital?